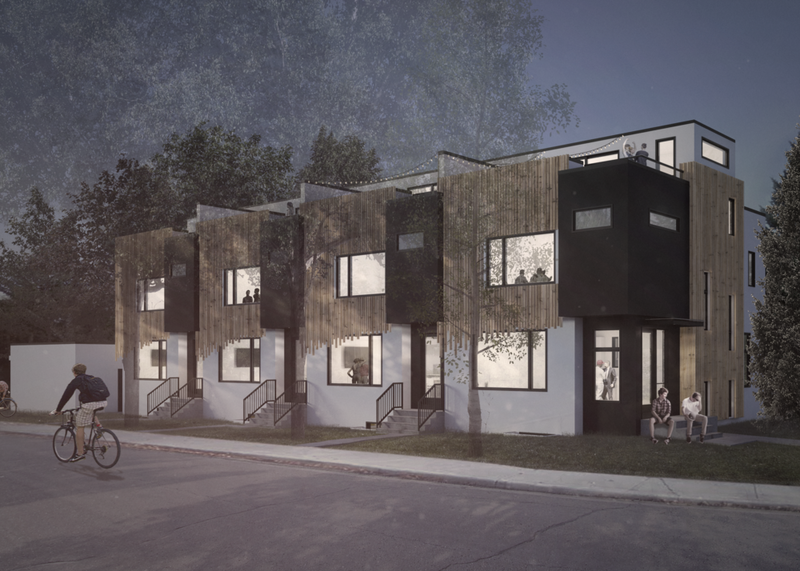 We've been working with RNDSQR to design a number of townhouse projects that take advantage of Calgary's R-CG district. In collaboration with Turbulentarch, we prepared renderings for most of these projects, and we are pleased to share them here. This project in Richmond has two units that face the street and two that face the avenue. The dual-orientation of the building offers an intriguing new perspective to the typical rowhouse massing, breaking it up the volume of the building and giving interest to each of the street facades. Additionally, the building is designed to soften the distinction between the individual units so the composition of the building as whole is what stands out. This four-unit project in Altadore, like KL26, has two units facing the street and two units facing the avenue. The material palette includes black vertical corrugated metal, white stucco and natural cedar in a chevron pattern. The broken-up massing and high-quality materials help make this project fit well within the surrounding neighbourhood. Also in Altadore, this four unit project faces 16th Street SW. The vertical cedar screen is flush to the parapet but has a variegated lower edge that gives the facade an organic, playful feel. This project is on an unusual site facing 5th Street SW, but rather than having a rear lane, it has a lane along the side of the building. Because this put the garages along one side, we configured the entries along a common walkway along the other. While the walkway is at grade, it isn't on the ground. The lower level of CB05 extends past the main entry walls and under the walkway, giving the residents a large flex space that could be used as a third bedroom or a lower entertaining space. This space is daylit by a long window well that extends almost the entire depth of the property. Privacy from busy 5th Street is achieved in part with brick screens that obscure views but allow light to filter both in and out of the unit. In Richmond, a stone's throw away from the Marda Loop commercial district, this four-unit rowhouse building features glazed lofts, and distinct unit facades textured with stone, stucco and cedar. With raked windows and large sliding patio doors, the loft area becomes a large indoor/outdoor space.